New, higher, prices are now in effect. I have not checked other retail sites on the web. 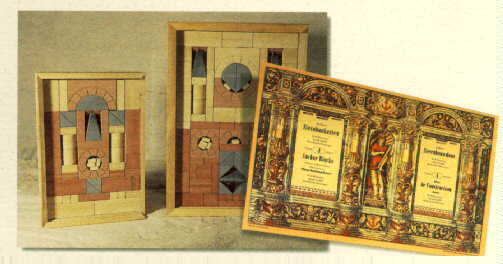 New Anchor® stone building sets and puzzles are being made again, and in Rudolstadt, by Anker Steinbaukasten GmbH, Breitscheidstr. 95, D-07407 Rudolstadt/Thüringen, Germany. Tel: 03672 / 31 11 0; Fax: 03672 / 31 11 29; e-mail. These wonderful sets are beginning to be imported into the USA once more. In February, 1997, these sets were reintroduced at the American International Toy Fair in New York. The new booklets of building plans for set GK-NF # 12, sponsored by the CVA, is now completed and available. It costs $ 15.00, post paid. When you see these books, you will be impressed with the quality of the designs. Three CVA members contributed design -- Fred Schlipf (USA), Dieter Wellmann (Germany) and Wolfgang Fichtner (Germany). If you purchase this book along with one of the new building sets, the cost is only $10.00 -- a special bargain price that is otherwise only available to CVA members, and they always add postage costs. This offer is being extended to all sets from # 10A on up. So add these design books to your next order. These new sets can be bought at retail stores. But because the retail distribution of Anchor sets and puzzles is still extremely limited, as a service to people who want to buy these new sets, I keep a few on hand and will send them, Priority Mail -- post paid, upon receipt of a check. Sets 20A or higher are sent FedEx, ground. (Special shipping, such as UPS-Air, is extra.) These sets may be ordered from George Hardy, 6 Deer Path Road, Palmyra, VA 22963. I am not operating a business, so I have no arrangements to accept credit cards. All sets (including 32A+B) are in stock! All prices include shipping within the USA! No Longer Available in the USA. Sales of the puzzles have been very slow for this site, so I do not carry them any more. I have been surprised that many buyers are adults who intend to build with the sets themselves. I do hope that they let the youngsters have a turn. If you would like to buy a set or two, some stones, or just have questions, please don't hesitate to contact me by e-mail. The CVA has published its Stone Catalog, which covers all of the stone shapes Richter made, plus shapes made by other innovators. Metal parts and most other accessories are included in the catalog. The contents of the sets are also listed. The cost of the catalog sheets (European size paper, intended for loose leaf use, but no binder) was f 48, plus postage costs, in Europe. A new revision is in process and will be completed soon, probably in late 2008. The updates concentrate on the contents of the unusual sets. The amount of detailed information is very great, and the information keeps coming in. All Anchor people need, and will want, a copy. I cannot e-mail a PDF file, as it is too large (almost 150M), but a download can be arranged. To print it out correctly, you need the European A4 size paper. For those who are really interested in Anchor stones, I have written a book about them. (I just got tired of either looking up the same information again and again, or trusting my memory on specific details such as dates and names.) It is expensive, $60 (or EUR 40) ppd, because I print it myself on my PC and color ink is expensive. The book undoubtedly contains far more information about Anchor stones and sets, the Richter company, etc. than you'll ever want to read. This book is a lot of work to print (I print about a dozen at a time; it is available in either English or German), so please don't think I am urging you to buy one. Remember you can buy it on CD-ROM for just $2.00, postpaid. Also on that CD you will find the CVA Stone Catalog. A picture of new sets #s 4 and 6.